Here at Great Grass, our artificial grass isn’t just used by private homeowners to make their gardens look lovely. In fact, we have a massive commercial client base too and our grass is perfect for corporate events. One of our most well-known clients has to be Manchester City Football Club. Last year, MUFC called us up on as Wednesday afternoon at 5.00pm, after being let down by another artificial grass supplier they were really in a bind and needed some artificial grass by 10.00am the next morning! Luckily, we were able to cut and deliver the required artificial grass in the nick of time and their event went off without a hitch. I guess that’s why we’re leading suppliers of artificial grass in the UK! Our artificial grass was used by children and adults to play a whole host of interactive football games including penalty shoot outs. A staggering 10,000 penalties were taken at the event and our grass was still looking as good as new. In fact, MUFC said they reused the artificial grass for more of their events. We were really pleased that we were able to help them out on such short notice and it’s what we strive to do with every client that gets in contact with us. No matter who needs artificial grass, we give each customer the same, excellent customer service. It’s just our way. 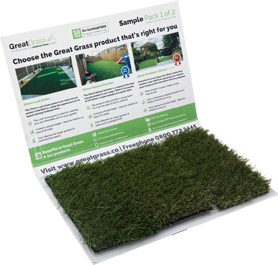 For more information on our range of artificial grass, have a look around our website. Alternatively, give us a call to discuss your requirements 0161 685 0071.